Olympia’s RVIVR, one of the many ex-Latterman bands and one who are known equally for their catchy pop punk and their fight against sexism, put out a new EP earlier this month via Rumbletown Records called Bicker and Breathe. If you were a fan of its predecessor, last year’s The Beauty Between, you’ll dig this one too. Stream it below. RVIVR are also about to go on a European tour, but first they’ll stop off in Brooklyn for two shows, both of which have great openers. First, they’ll play Brooklyn DIY venue Shea Stadium on September 29 with Columbus, OH’s Pretty Pretty and NYC’s Even Hand (who were great opening for Swearin’ earlier this year). Then they’ll play the slightly larger Saint Vitus on September 30 with local greats Aye Nako, the long-running Shellshag, and Bethlehem, PA’s underrated Slingshot Dakota. Tickets for Shea and Vitus are on sale now. All RVIVR dates are listed below. Meanwhile, right before those shows you can catch Shellshag and Pretty Pretty together at Death by Audio on September 27. That also includes Crow Bait (who share a member with ex-Latterman band Iron Chic) and is part of their tour with Seattle’s Murmurs. Brooklyn’s Magnets are on the bill too. That Crow Bait tour kicks off with a Long Island show on September 25 at The Wood Shop which also includes Iron Chic and Even Hand, plus it’s the first show in 18 years from early ’90s Long Island indie/punk/emo band GreenSleep, and includes the Defiance Ohio-related Purple 7. GreenSleep put out their first new music since 1995 this year. Stream that, alongside their ’95 LP, below. All dates on the Crow Bait tour are also listed below. 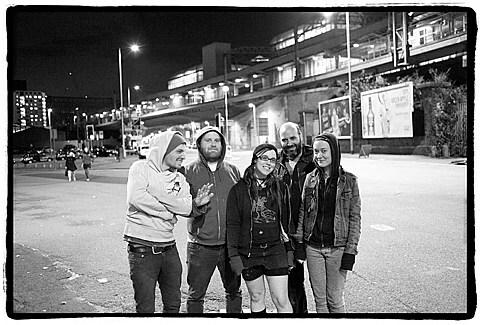 Aye Nako also open the Glasslands stop (11/1) of the Ex Hex / Speedy Ortiz tour. Tickets for that show are still available.